Olaf is watching you, too. It was a bright cold day in November, and the clocks were striking 9. Many of those gathered along the barricades of the Macy’s Thanksgiving Day Parade were there to marvel at the floats, enjoy the performances, and bask in the warmth of each other’s holiday cheer. Not me. I was there to catch a glimpse of one balloon in particular, making its parade debut. At last, I would be face to face with the largest imaginable incarnation of my longtime nemesis: Olaf, the snowman from Frozen. We’re still a full year away from the release of Frozen 2, but Olaf is back in a big way. He’s set to make his Broadway debut early next year, where he’ll be played by Greg Hildreth. And just last week, he could not only be seen looming over 6th Ave, like some of kind of unholy, inflatable alien invader, but also looming over filmgoers in nearly any theater in America. He’s the star, after all, of Olaf’s Frozen Adventure, the animated short that’s preceding screenings of Disney-Pixar’s Coco. I didn’t always loathe Olaf. In fact, when Frozen first came out in 2013, I was pleasantly surprised that the character, who seemed to have Jar Jar Binks potential in the film’s first trailers, was actually pretty funny, if not especially relevant to the plot; he might not have been on par with Timon and Pumbaa or Genie, the paragons of Disney comic relief, but at least he wasn’t a Gurgi-level disaster. This was thanks in large part to Josh Gad, who improvised some of his dialogue and whose delivery tipped the scale from unforgivably annoying toward winningly naïve. As transparent attempts to sell toys go, I reasoned, you could do worse than a snowman who likes warm hugs and dreams of summertime. Four years later, though, that dopey little snowman gets under my skin in a way that no Minion ever could. Maybe that’s because, while we’re never truly free of him, Olaf’s popularity peaks around the holidays in a kind of reverse hibernation: As soon as the weather turns cold, he emerges from whatever cave he’s been hiding in during the warmer months and is suddenly omnipresent. It’s exactly this time of year that the very sight of him starts to rankle, whether it’s one of his malformed look-alikes accosting me in Times Square or a hundred miniature versions baring those buck teeth from nearly every shelf in the toy aisle. Wherever I turn, staring up at me from my plate, from the Christmas tree, from the skin of those who’ve chosen to mark themselves permanently with his goony face, he’s there. Olaf is watching me. I’m far from alone in disliking the character (or at least, what he’s become). Mexican audiences were reportedly so displeased by having to sit through Olaf’s Frozen Adventure before Coco that some theaters issued an apology and stopped showing it altogether. That did not bode well for the short’s success in the U.S., especially with the memory of Frozen Fever still fresh from two years ago. That animated short, which debuted ahead of Kenneth Branagh’s live-action Cinderella, was an unwieldy, overstuffed mess about Elsa trying to throw a birthday party for her sister. Olaf, flanked by an army of even more mini-Olafs, had never been more irritating. It was with trepidation, then, that I sat down for Olaf’s Frozen Adventure, which, at a whopping 21 minutes, is a whole lot longer than Frozen Fever was. The short begins with Olaf terrorizing the staff of the palace by popping out of unexpected places, which is the stuff of nightmares but which the put-upon servants seem to regard as cute. “Not yet, Olaf,” they chastise lovingly after recovering from their terror. We had reached what felt like the hundredth “happy merry holly jolly” in Olaf’s interminable song when it finally happened: I felt my resistance beginning to slip. We were only halfway through the entire short, and the little snowman was cancan-ing with a kitten in each hand, as if to say, Look at the shameless lengths I’ll go to just to hold your attention. Wouldn’t it be so much easier to just give in? Reader, it would. Children in the theater, giggling loudly, were clearly falling for Olaf’s act, and I could feel my defenses breaking down, weakened by the animation, which was now imitating the fabric of a Christmas sweater, and by the bubbly melody of a song I was already forgetting, even as I was still listening to it. Soon after, when Olaf, lost in the woods, suggested glumly that “Maybe I should just stay lost,” I knew my emotions were being manipulated but was powerless to do anything to prevent it. 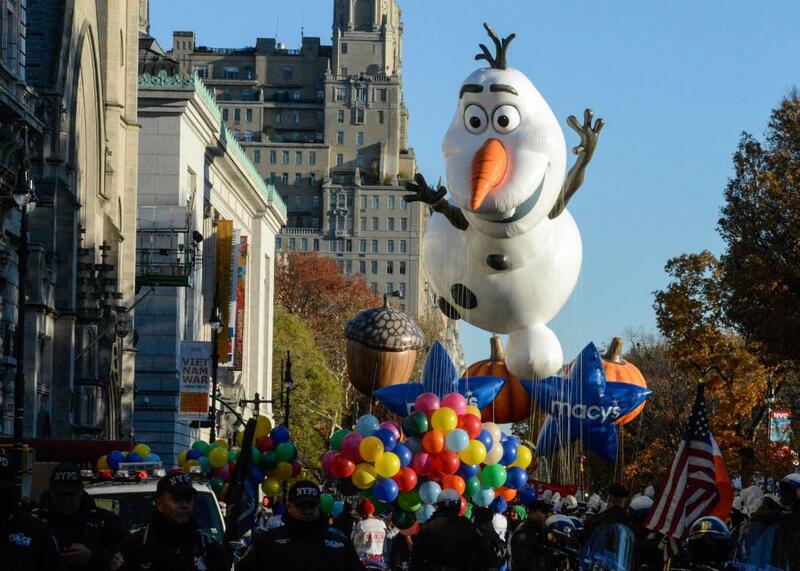 By the time the short reached its heartwarming conclusion—the real tradition was Olaf all along!—I was no longer bothered by the thought of seeing Olaf on the front of every seasonal greeting card for the past few years or hovering, 60 feet tall, over the streets of Manhattan on Thanksgiving. Instead, I let it go. I let it all go as I was enveloped by a pleasantly bland haze, one that had been carefully fine-tuned and focus-grouped and optimized to sell the most possible merchandise. As I did so, I gazed up at the enormous face. Four years it had taken me to learn the meaning of the smile that was hidden beneath the carrot nose. O cruel, needless misunderstanding! O stubborn, self-willed exile from the loving breast! Two eggnog-scented tears trickled down the sides of my nose. But it was all right, everything was all right, the struggle was finished. I had won the victory over myself. I loved Olaf. Now, please point me to the nearest Toys R Us.